With his recent project, Public Shelter, Dutch visual artist Sil Krol explored the possibilities of permanent sleeping solutions for homeless by simply providing a clean and simple shelter in a ‘residual’ space under a highway overpass. Public Shelter was part of the Civil Disobedience expo by Belgian art center In De Ruimte that was open until June of 2018. Sil Krol was invited to come up with an intervention that fits within the expo theme ‘civil disobedience’. The idea for Public Shelter came to him while he was in Paris, where he witnessed astonishing numbers of homeless people sleeping under highway viaducts. He was fascinated by the semi-temporary spaces that the homeless had built and wondered, what if spaces under highways were transformed into permanent and safe spaces to spend the night? Obviously, Sil Krol realized the opposite was happening. Cities worldwide are becoming more hostile towards the homeless, rather than facilitating them. Therefore, he decided to take measure into his own hands and built an ‘official looking’ sleeping place for anyone, not only homeless people, to access. The space was designed to be impossible to claim ownership of, in order to really keep it public. Sil built the Public Shelter underneath the Keizerkarelbrug in Ghent, where conditions were ideal. He was able to install a plateau that rests on the overpass’ pillars. The site was clearly visible from the footpath underneath and the location was already well known to homeless people. The shelter featured a simple, easy to clean mattress, a led light that runs on batteries, and semi-transparent windshields. So far, the shelter has been used by multiple people. Sil Krol even “found traces of a romantic night” in the shelter. Despite the intention of being public, the shelter has been claimed by a homeless person who figured out how to ‘lock’ the shelter upon leaving it. The new permanent user even furnished the shelter with an extra mattress and personal decorations. Today, the shelter appears to be vacant and vandalized. Nevertheless, Sil leaves it up to the users to maintain it. In practice, Sil learned that it’s quite complicated to create a public space that is both public and safe. How should cities go about the homeless population and their needs for shelter? Could smart-locks make sure the shelter becomes truly public and multi-user friendly? How about connecting shelters to city heating? And how should cities deal with underused residual spaces like underpasses? What Public Shelter has (unintentionally) proven is that illegal sleeping activities can be fitted into cities without causing any disturbance or visual ‘pollution’. 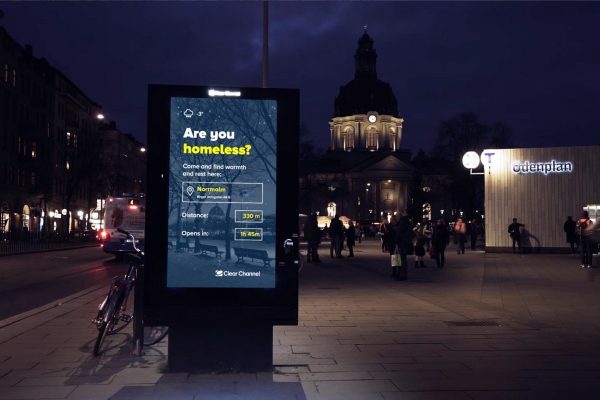 It provided a peek into the future potential of more permanent and more safe solutions for the urban homeless and for others to realize the importance of primary human needs like housing and safety. Chicago-based brand marketing studio Alt Terrain is specialised is new collaborative marketing campaigns. They have designed a live mobile billboard to bring outdoor advertising to life.